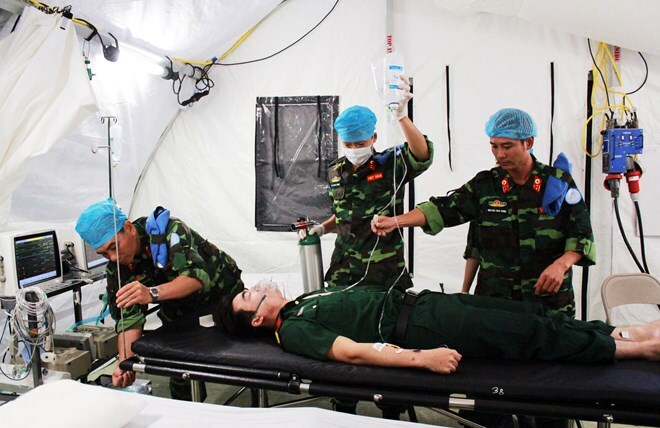 HCM City (VNA) – The Vietnam Peacekeeping Centre and the HCM City-based Military Hospital 175 wrapped up a programme on level-2 field hospital equipment practical training on September 19. The practical training on equipment of Vietnam’s first field hospital model, set to join the United Nations peacekeeping mission in South Sudan in 2018, began on September 6. It saw the direct engagement of 69 officers and soldiers of the field hospital, along with eight British and seven US experts who have a pool of field experience in peacekeeping operations in South Sudan. At the closing ceremony held at Division 317 of the Military Region 7 High Command, Sen. Lt. Gen. Pham Ngoc Minh, Deputy Chief of the General Staff of the Vietnam People’s Army, underscored that the participation in UN peacekeeping forces aims to realise Vietnam’s foreign policy of peace, cooperation, development, and multilateralisation and diversification of foreign relations. It is also meant to affirm that Vietnam is a trustworthy partner and a responsible member in the global community with active and proactive international integration and practical contribution to peace, stability and security in the region and the world, he added. Minh, who is also deputy head of the Defence Ministry’s steering committee for Vietnam’s participation in UN peacekeeping operations, said the practical training is critical since it helps to comprehensively assess Vietnamese peacekeepers’ capacity of deploying, operating, managing, commanding and dealing with medical situations and field hospital withdrawal. It was also a step to prepare for the UN’s pre-deployment examination before the field hospital is sent to the mission in South Sudan in early 2018. He also appreciated British and US experts’ assistance for the practical training programme. US Consul General in HCM City Mary Tarnowka said her country always strongly supports Vietnam, helping it to be more confident, active and influential in assisting the international community to address challenges. Vietnam’s engagement in the UN peacekeeping force reflects not only the growing security partnership but also its determination to realise the commitment to global peace and stability. Meanwhile, UK Ambassador to Vietnam Giles Lever said the UK pledges to continue assisting Vietnam by providing information, sharing solutions to challenges during the peacekeeping force deployment in South Sudan, sponsoring the foreign language skills improvement programme, and promoting military engineers’ specialised capacity.